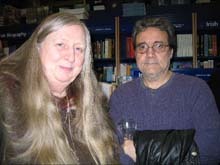 The left-hand picture above shows two Irish poets — Cormac's sister Eiléan Ní Chuilleanáin and brother-in-law Macdara Woods — at the Irish Solution launch (right) in Eason Hanna Bookshop on Dawson Street, Dublin (March 2004). In 2010 Eiléan won the International Griffin Poetry Prize. Cormac's daughter Órla Ní Chuilleanáin has published short stories, most recently in the Trinity College Dublin anthology Facing White; in 2010 she won the Oireachtas Prize for a radio play in Irish. Órla's sister Léan has has short fiction published in Irish, English, Italian and Hungarian, and in 2013 she sold her first novle, The Living, to Atlantic Books, London . Cormac's wife, Phyllis Gaffney, is an academic author whose works include a prizewinning history of the Irish hospital at Saint-Lô in postwar France: Healing Amid the Ruins. 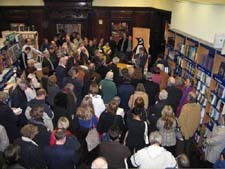 Details of more than sixty books by immediate family members can be found at the website dedicated to Cormac's mother Eilís Dillon. 2006 saw the publication of All in the Blood, the memoirs of his grandmother Geraldine Plunkett Dillon, and in 2012 his first cousin Honor O'Brolchain published a biography of Joseph Mary Plunkett, great-uncle, poet, and signatory of the 1916 Declaration .